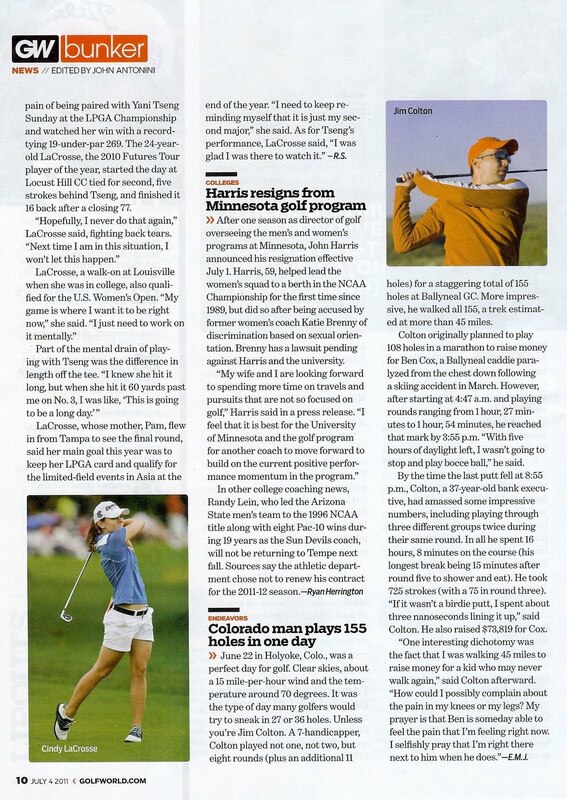 Check out the latest edition of Golf World. My ugly mug in print! More on this later, but I do enjoy how they are foreshadowing my eventual move to Colorado. And thanks again to Brian Carruthers for the unintentional sand-bag. 7-capper. Golf World is personally significant for me as it reminds me of my late grandparents, who are the reason that I play this great game. They had gotten a free subscription to Golf World from a Florida car dealership back when they bought a Buick probably in 1988. They kept getting the magazine long after that car was long gone, past when my grandpa died in 1996 and right up until my Nana died 18 months ago. When I would visit my Nana after college, I would pour through old GolfWorld's about 8-10 at a time. I spoke during my Nana's funeral service and talked about these visits, where I would come down with my friends and play nearby World Woods for 3-4 days straight. These trips were really the genesis for every far-flung golf buddy trip since. My Nana lovingly whipped up a meal that undoubtedly included a huge bowl of mashed potatoes and her awesome homemade apple sauce. We'd golf all day, eat at 8 and we konked out by 9:30. What great guests! The price for all of this hospitality was occasionally getting on the roof to clean out the gutters, where one false move might leave you impaled by a lightning rod. I also spoke about how trying to make my grandparents proud of me was a motivating factor growing up. It kept me on the straight and narrow in school and kept my grades up in college. The mantra "Make Nana Proud" has kept me striving to be a generally decent guy ever since, even now after they are gone (maybe even more so). I can't help but think they'd be proud seeing this "Colorado man" in their free subscription of Golf World this week, once the "our grandson is crazy...but I guess we already knew that" eventually wore off. Ya, it's an ugly mug. You should start wearing makeup.